Here's the Lorentz, one of the fleet of C-ships we'll dispatch on missions to explore space and time. The Lorentz is has just pushed off from space dock, and is preparing for departure. 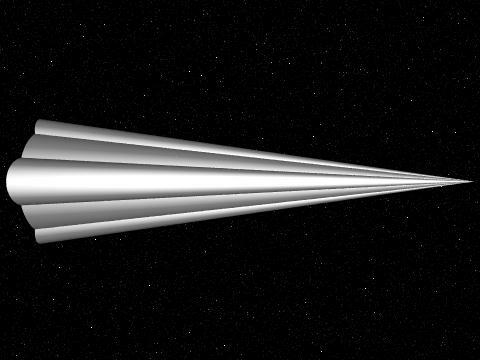 Our C-ship is powered by the annihilation of matter and antimatter, and can accelerate at a sustained rate of 100 metres per second per second—a little more than 10 Earth's gravities—to velocities arbitrarily close to the speed of light. Most C-ship missions are unmanned: probes or lifeseeds. Manned missions generally accelerate no faster than 1.2 gravities due to the frailness of their cargo. The C-ship violates no known principle of physics, but producing the antimatter consumed by a C-ship's drive in a single second would cost, using current technology, many orders of magnitude more than all the economies of Earth combined. But by the time our descendents are able to make use of all the resources of the Solar System, including the entire energy output of the Sun, they'll be able to build C-ships, albeit with a maximum speed set by the energy available to power them. C-ships are streamlined not for style, but by necessity. Space is not a vacuum but rather a diffuse gas of relict photons left over from the Big Bang—the cosmic background radiation with a temperature at the current epoch of about 2.7 degrees above absolute zero. When we travel at velocities approaching the speed of light, this radiation creates a drag on our ship which we must minimise through radical streamlining. Interplanetary ships may look like flying junkyards, but our interstellar and intergalactic craft must be rapier-like to pierce the tenuous birth-cry of the universe. Our ship is icy-white in colour for the very excellent reason that its exterior is made of water ice, one of the most abundant substances in the universe. When we travel at extreme velocities, dust particles impact our ship with the energy of a nuclear bomb, and even hydrogen atoms erode her hull. Before embarking on a mission, we re-make the surface of the ship with ice harvested from the abundant comets surrounding the star we're departing. During the mission, self-reproducing robots built with molecular-scale engineering repair damage to the ice shield around our ship. The ice protects us against impacts with interstellar and intergalactic gas and tiny dust particles. If we hit something of tangible size, like a rock, it'll be a really bad day; astronomers on distant planets will catalogue yet another enigmatic gamma ray burst. where a is the rate of acceleration of the ship, t is the time, measured by the ship's clock, the acceleration has been underway, and c is the speed of light in vacuum. Then d is the distance travelled, v is the velocity attained, and tr is the elapsed time at the location where the ship began its acceleration. 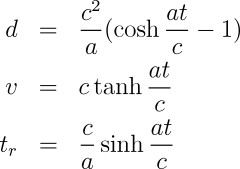 Let's apply these equations (including their solutions for ship's time, t, expressed in an equation package developed for use with Wolfram Research's Mathematica and derived using that tool), to show how the captain of a C-ship is truly a master of space and time. Here's a table that shows how long it takes, in time measured on board the Lorentz, to travel to various places, near and far. In each journey, we'll accelerate at a constant 100 metres per second per second until the halfway point, turn around, and decelerate at the same rate, coming to a stop relative to our destination. For each voyage, I'll show the maximum speed at the halfway point as a fraction of the speed of light, and the elapsed time, measured at the starting point, when the ship arrives at its destination. so many digits I have write them on the next line! In other words, on board our C-ship, we can go anywhere in the universe in five years ship's time, though millions or billions of years may have passed at our port of departure. As absurdly close to the speed of light as the last few velocities may seem, and however unimaginable the energy it may take to attain them, they're nowhere close to the speed record for material objects in the universe. On October 15, 1991, a cosmic ray proton collided with the Earth's atmosphere, releasing an energy of 3×1020 electron volts—as much energy as a brick falling on your toe. To pack such energy, this Oh-My-God particle had to be travelling at 0.9999999999999999999999951 times the speed of light, so much faster than even the maximum velocity on our 17 billion light-year journey to the edge of the universe that the particle would make the trip in only 19 days, compared to the 4.9 years it took our ship. Our ship is equipped with a full complement of powerful sensors, covering the electromagnetic spectrum from very low frequency radio waves through gamma ray and cosmic ray energies. Its powerful on-board computer presents sensor input on the main viewer with or without compensation for the effects of relativistic flight.